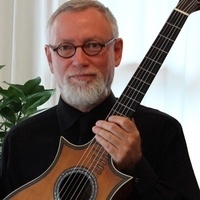 The DePaul University School of Music is pleased to announce a new guitar workshop and masterclass led by Coordinator of Guitar Studies and guitar instructor, Mark Maxwell. The first part of the session will be a technique class where all participants will be onstage together, discussing and performing various aspects of guitar technique and strategies for the development of both the right and left hands. Following this will be a two-hour masterclass, featuring four participants. This is a great opportunity to learn more about the guitar program at the DePaul School of Music. If you would like to be considered for participation, please sign by clicking the blue "Register" button. If you do not wish to perform, but would like to attend, we would be happy to welcome you.